I met a hero recently; a real-life hero, an unassuming hero, an unwitting hero, but a hero nonetheless. 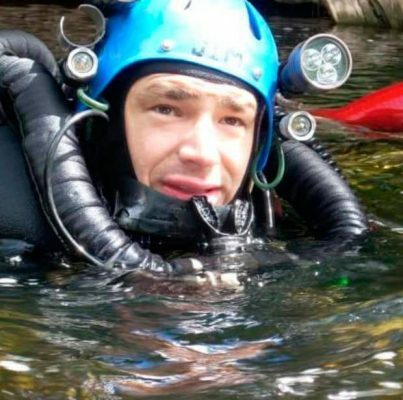 An electrician Monday to Friday, a cave diver on the weekends, Belgian national Jim Warny, now living in Co.Clare, was thrust under national and international spotlight last year when he was part of the Tham Luang cave rescue mission in Thailand to help rescue 12 boys and their soccer coach who were trapped when flood waters rose and pinned them underground in pitch darkness completely incommunicado, 4.5 km from the cave entrance for eighteen days. It was a superhuman effort by thousands of volunteers, Jim Warny being but one, but it was Jim who led the coach to safety, totally sedated, as were all the children, traversing 4.5km of underground passages, mostly underwater, by pulling him along on a stretcher fitted with oxygen. Though all 13 were successfully rescued alive, a 37-year-old former Thai Navy Seal perished in the attempt; clearly demonstrating the huge risks involved. Jim was interviewed on stage at the Pendulum Summit and what struck me was how calm he was; he doesn’t see himself as a hero, just a regular guy, an electrician Monday to Friday, cave-diver at weekends, who, when the call went out looking for experienced cave-divers from around the world, put up his hand and said, “Here I am, send me.”, jumped on a plane and into the history books. When he was asked about the dangers, he said, there are serious risks involved, mainly because you are on your own most of the time. I was intrigued by his advice, “compartmentalise your thoughts”, the ability to focus on the immediate present and the task at hand, to solve one problem at a time, sequentially. If we were to adopt some of Jim’s philosophies on life, perhaps we could do better in our own lives and careers. One of the things I found particularly interesting was when he told us there was actually nobody in charge in Thailand, no one-person with total responsibility for the mission, it was simply a collection of professionals who came together to offer their very best to the whole team to make sure those kids got out safely. I was reminded of Simon Sinek, who taught us all, “It starts with ‘Why?’” Why were they all there? One absolutely overriding mission, to get 12 boys and their coach out safe and alive. So, everybody played to their own individual strengths, egos were put to one side, the question was what was right for those boys and their coach? How are we going to execute this why? And they did it one step at a time, one slow kilometer at a time. I felt there are a handful of lessons, besides the thoughts compartmentalization, we could benefit from, using Jim’s story. Firstly, it starts with ‘Why?’ Whatever it is you or I are about, there must be an overarching purpose, and if we find that, the ‘how’ will be easier. Secondly, you’re a professional at something, so am I, and if we play to our strengths, rather than competing with each other, we can pull off metaphorically what the pros in Thailand did in actuality, we can make the world a better place. Next, we need to get comfortable being uncomfortable. We’ve got to stretch ourselves beyond our comfort zones. Jim Warny did that for many years, cave-diving on the weekend, so once the call went up, he was comfortable enough to raise his hand and volunteer. He couldn’t have done that if he hadn’t made himself uncomfortable when he started out twenty years ago. In fact, in an Irish Time interview he commented that it was difficult to focus en route to Thailand, but once he was in the caves, he knew it was within his comfort zone. And the fourth lesson I think we can learn from Jim and his fellow heroes is perseverance! We need to persevere until when? Until the very end. There was no time-clock on the Thai Cave Rescue, they didn’t knock off at five and watch TV for the night – they stayed at it until it was done. The job was only finished when the last person was extracted safely. So, whatever it is you and I are about, or going through, we need to persevere until when? Persevere until the end – until the job is done. We must be open to the possibility that the Universe has a purpose for our lives that we haven’t yet considered. On Wednesday 9th January 2019, I had the great pleasure of chatting with Jim, one on one, for a few minutes at the Pendulum Summit about what happened, how he got involved and what is next for him. His life had been transformed through circumstances beyond his control in July 2018 – he now has a story to tell; a mission in life. He told me he handed in his notice as an electrician the day before we met, on Tuesday 8th January 2019.